I arrived in Gulmarg by mid-January 2016 and was pleased to find the ski area already covered with sufficient snow to ski all the runs on Mt. Apharwat. Contrary to previous seasons also the snowpack was stable early in the season and as a result thereof we were able to take full advantage of the terrain right from the beginning of the winter. Gulmarg has established itself as a preferred backcountry ski destination and is today the only cable car serviced powder ski resort in the Himalaya. Since 2006, we have been offering our professional ski guiding services in Gulmarg to visitors and welcomed until now more than 1’000 guests from all over the world as participants in our backcountry skiing programs in the Himalaya. Sunny days, perfect snow conditions and mostly low or moderate avalanche danger levels on one hand and inner unrest, frequent strikes and curfews on the other hand were the distinguishing marks of our 8th ski season in Gulmarg, Kashmir. Despite these few disturbing events outside of Gulmarg our 180 guests were able to fully enjoy their stay in Kashmir, have completed numerous powder ski runs on Mt. Aphawat and got a comprehensive impression of this exceptional ski area in the Himalayas. Gulmarg 2013 – A Ski Season Review from chris werren on Vimeo. Since the opening of phase 2 of the Mt. Apharwat gondola in the winter 2005/2006 the popularity of Gulmarg as backcountry and adventure ski destination has continuously risen. 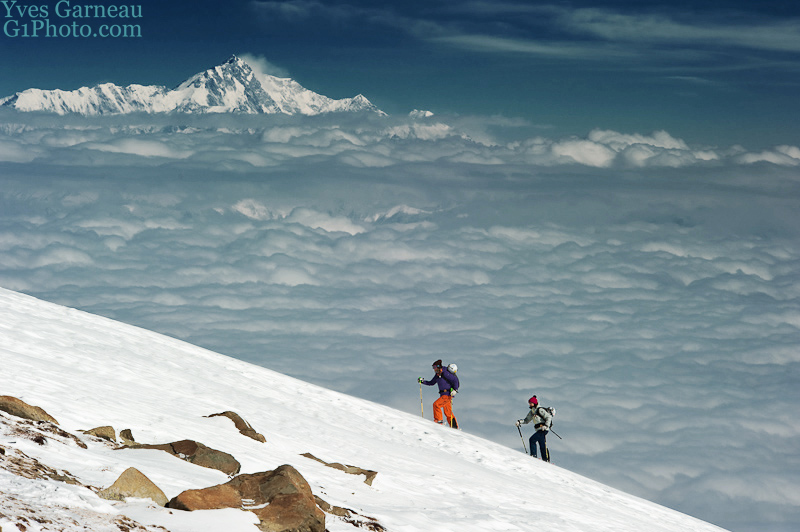 The number of visitors and participants in our programs has also increased during this time and every winter we welcome now several dozens of enthusiastic skiers and snowboarders from all over the world in the Himalaya and introduce them to the terrain and the incredible views on the mountains like on the 8’126m high Nanga Parbat on the picture below.